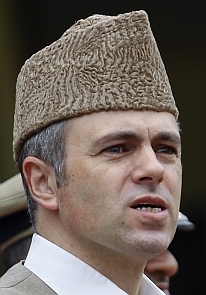 Omar Abdullah, who on Wednesday resigned as chief minister, indicated that his National Conference could play a part in government formation in Jammu and Kashmir after the election threw up a hung assembly. At the same time, the NC leader said the onus of government formation lies primarily on the Bharatiya Janata Party and the People’s Democratic Party and his party will adopt a wait and watch approach. Recalling that in 2002 NC with 28 MLAs had opted from first day to stay out of the government formation and "it became very easy for Mufti Sayeed with 16 MLAs to form the government", he said, "today I am not in any mood to make it easy for other parties to form a government. Let us see what happens." "It is the duty of the PDP and BJP to form the government. Let us see what they will do," he told reporters after submitting his resignation to Governor N N Vohra. He said that the NC has had no discussions with anybody on government formation. Omar gave similar hints with his tweets when he said, "Incidentally in 2002, Mufti Mohammad Sayeed became chief minister with 16 MLAs and NC with 28 (MLAs) sat in opposition. So excuse me if I don't oblige by rolling over to play dead." While the PDP emerged as the single largest party in the assembly with 28 seats, it fell way short of the 44-seat mark in the 87-member house needed for forming the government. The BJP won 25 seats followed by the NC (15) and the Congress 12, while other parties and independents bagged seven seats. Omar also took a dig at the winners saying that while his party was pleased with its performance, the PDP which has more seats must be feeling defeated as its result did not match the "hype". "NC has 15+2 (independents) and we are very pleased, the PDP has 28 and Mufti sahib hasn't been seen, much less heard. Clearly the more you have the more you want," Omar wrote on micro-blogging site Twitter. "Expectations were hyped and twisted to such an extent that now 17 feels like a victory and 28 a defeat. Go figure!" he added. Speaking to reporters, Omar said, "Remember in 2002, NC had 28 MLAs and we opted from first day to stay out of the government formation and it became very easy for Mufti Sayeed with 16 MLAs to form the government and stay in the power for three years and rest period to Congress-NC coalition. "Today I am not in any mood to make it easy for other parties to form a government. Let us see what happens."